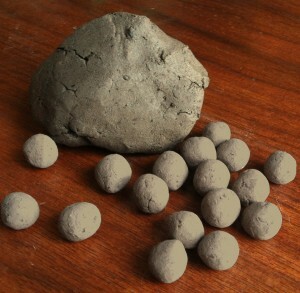 Seed ball matrix and finished seed balls. Pinch off enough matix to make a seed ball. Flatten it with your thumb and forefinger. Place the appropriate number of seeds in the matrix. Smaller seeds should go near the surface of the seed ball. Obtain a count or decent estimate of the number of seeds. Figure out how many seeds you want to use in each seed ball. Use the correct amount of matrix: for large seeds, I use 4g of matrix per seed ball. For small seeds, 2-3 grams. Wedge the seeds into the clay with the heels of your hand on a flat surface. Note that many seeds are large and flat (ie Milkweeds). See Flat Seeds* below. Subdivide the clay until you get the planned number of chunks. Roll (for example, If I am going to make 300 seed balls, I divide into three even chunks (100 seed balls), then each 1/3 I divide into 4 (25 seed balls). That I pat into a square and cut 5×5 (each one is one seed ball). Roll the matrix flat, sprinkle the seeds on it so they, too, are flat. Cut the slab in half and stack. Maintaining the correct moisture is important for workability. Keep your matrix stored in a plastic bag. If it is too wet, air dry it a bit. If it is too dry, wrap some moist rags around it: it will quickly stoften. You can also spray some water on it and wedge it in for faster results. If the big chunk dried out. No loss. Break it with a hammer or block of wood into crumbs and add water, mixing as it softens. Drying it out will not hurt it. If you work with anything long enough you get pretty comfortable with it and can take for granted potential hazards. Don’t forget that seed ball matrix is microbially active. Compost can contain organisms that might not be so good for your gut like E. coli, since it passes through the enteric system of invertebrates, and sometimes other critters. Wash hands when your done, especially those of kids who might just put their hands in their mouths and noses as a matter of course. We make our seed ball matrix to exacting standards. Seed-Ball.com owner, Dr. Blake Ketchum, has worked as a professional soil scientist and as a professional sculptor, so when the seed ball clay meets her approval, it’s got to be mighty fine stuff.